I will be hunting moose for the first time with my sons. We will not qualify for the adult tags so we plan on hunting a calf. It would seem to me that calling will be of no use. Is there a preferred method to getting where the calves may be? I understand that being close the water is a good start. Yes, near water is going to be a good place to hunt moose calves. If you are hunting on a lake or slow moving river, moose cows and calves may be found during early morning or later in the evening along the shorelines. Another method of hunting moose calves will be to track them. 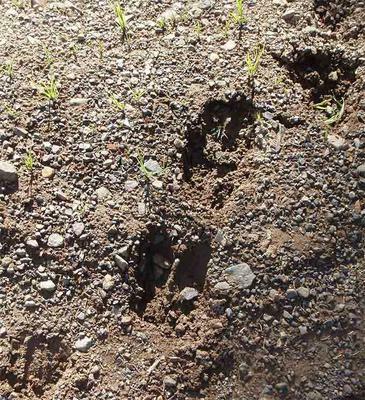 Moose calf tracks are easy for the hunter to distinguish from the adult. The calf moose track being less than 3" (76mm) in length compared to that of an adult which may be 4 to 6 inches (102 to 152mm). Direction of travel is distinguished by observing the track. The pointy end of the imprint shows direction of travel. Of course if there is snow on the ground, tracking becomes a much easier thing to do or if the ground is soft (as in the picture), you will also be able to track moose easily. Conversely, when the ground is hard and dry it can be very difficult to track any moose, let alone a small one like a calf. Cows with calves are more difficult to track than bulls, because they are especially alert to danger that may imperil their calves. For any type of tracking, it is imperative for the hunter to stop frequently to "observe". 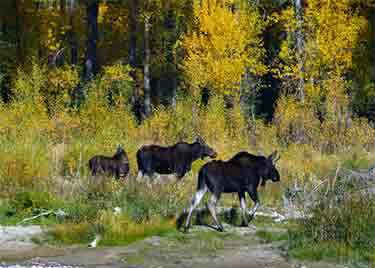 Moose have keen, senses and are able to distinguish non-moosey sounds easily. Through the action of stopping and looking and listening the hunter will break up his own human sounds which will spook a moose. Tracking moose, like many other aspects of moose hunting requires practice. Time in the field and boots on the ground will make major differences to your moose hunting successes. As mentioned in previous articles, there is a lack of information regarding the hunting of moose calves. To some degree, hunting moose calves remains a mystery.